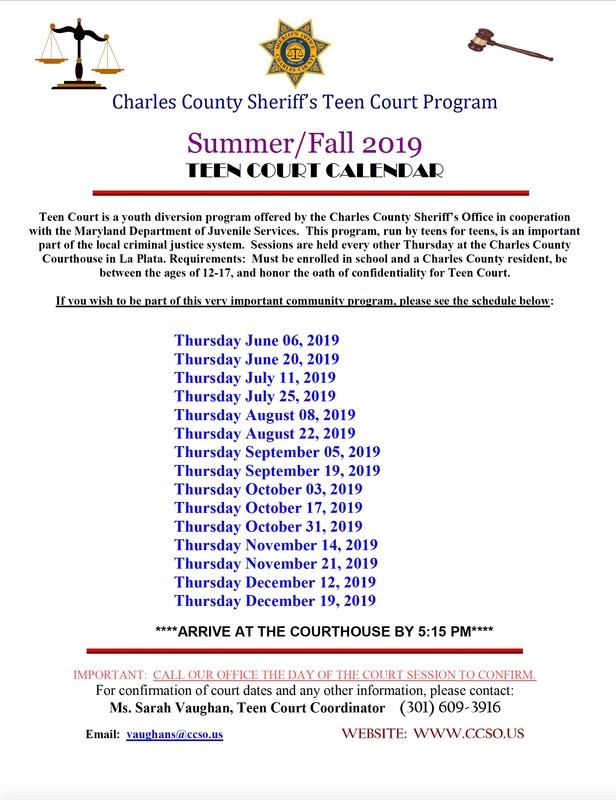 Charles County Teen Court is a juvenile justice diversion program in which first-time offenders between the ages of 12 and 17 are judged by a jury of their peers and offered the opportunity to accept accountability for their minor crimes without having to incur a permanent record. The program is designed to reduce the number of youth offenders and educate them in a realistic court environment. Since Teen Court's establishment in March 2001, hundreds of teens have taken the opportunity to accept responsibility for their actions and change their behavior. Teen Court also gives teens who are interested in the judicial system the opportunity to help their peers while gaining first-hand knowledge of the court system. The program offers adult volunteer opportunities as well. Contact Teen Court Coordinator Sarah Vaughan with questions by calling 301-609-3915 or e-mailing VaughanS@ccso.us. Trial Night Please arrive at the Charles County Circuit Courthouse at 5:45 p.m. The address is: 200 Charles Street, La Plata MD 20646. Dress Code Respondents should wear business attire. Acceptable attire includes slacks, collared shirts and sweaters for gentlemen and slacks, skirts, dresses and blouses for ladies. Absolutely no flip-flops, ripped clothes or t-shirts are permitted. Check-In When you arrive to the Courthouse, please notify Court Security you are appearing for a Teen Court trial. Court Security will need to know the respondent's name. Before the Trial Teen Court is conducted in three court rooms. Three or four cases are presented in each room and cases can last up to 45 minutes. Please be patient while waiting for your case to be called. Do not leave the courthouse as your case may be moved to another court room. Trial When a case is called, the respondent will sit at the table and parents will sit in the first row of benches. The judge will speak with the respondent for a few minutes and the respondent will then take the stand. The trial will begin. Reminder to Parents During trial, parents are not allowed to speak for their child. When the trial concludes, parents who have concerns may ask the bailiff to summon the Teen Court Coordinator, who will answer any questions or address other concerns. This is a voluntary program, if at any time you or your parents want to leave the program, contact the Teen Court Coordinator, Sarah Vaughan. 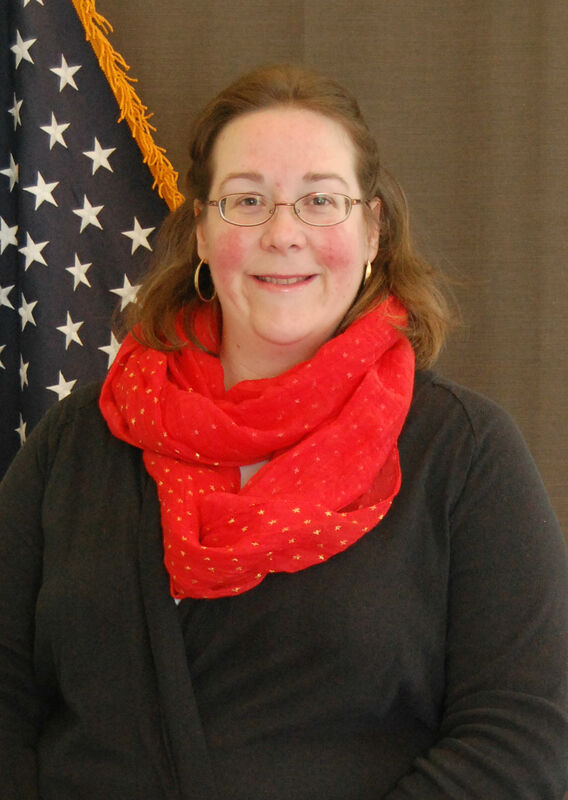 Ms. Vaughan is in the office Monday-Friday 9 a.m. to 5 p.m. and her direct phone number is 301-609-3916. School Resource Officers are also available to answer Teen Court questions during the school day. To volunteer for Teen Court, download the youth application and bring it to the next Teen Court session. If you are currently or were previously a youth volunteer, please download and complete the Youth Volunteer Renewal Application. Invitations to Field Trips: Previous field trip locations include the National Museum of Crime and Punishment in Washington, D.C.; the National Aquarium in Baltimore; and Mount Vernon, Virginia. Field trips are offered throughout the year. Conferences: Each spring, 10 Teen Court volunteers are selected to attend the Maryland Law Day Conference in Baltimore. During the one-day conference, teens from throughout Maryland meet and learn about laws. Lectures: Each month, Teen Court invites guest speakers to give presentations to volunteers and their parents. The speakers discuss a variety of topics including law enforcement careers and personal well-being, including how to handle stress. Community Service: For each session as a jury member, lawyer or bailiff, teens will receive four hours of community service which can be used for school purposes. If you have been referred to Teen Court due to a suspension to the Superintendent, below are some things you need to know before you come to Teen Court. Teens Information: ~You are not on trial for any type of charge. You are strictly coming to participate as a volunteer in the program. ~You can arrive at the La Plata court house located at 200 Charles Street, La Plata, MD 20646 as early at 5:15 p.m. You must dress court appropriate. For gentlemen, this means slacks and a button down shirt or a polo. For ladies, this means slacks, a nice shirt, or dress/skirt (which must be of an appropriate length). ~When you arrive at the court house please check in with court security and tell them you are a volunteer. Let them know that you are a first-time volunteer and need to know where to sign in. ~Once you sign in, you will then be put in your assigned court room. Parent Information: ~If you have any questions regarding Teen Court, please call the Teen Court Unit at 301-609-3916 during business hours. The hours for the Teen Court Unit are as follows: Monday –Friday 9 a.m. - 5 p.m., and on Teen Court nights 9 a.m. - 4:30 p.m. ~Parents are not allowed to sit in the court room during trials. You are more than welcome to walk your child into the court house to see where they are going as well as wait for them in the lobby. You may also drop them off and come back to pick them up at 8:30 p.m. ~If you need a letter prepared to turn in to the Board Of Education, please give at least 72 hours notice. All letters will have to be picked up at the office of the Teen Court Coordinator (10435 Audie Lane, La Plata, MD 20646). Seeks justice by arguing for an sentence that is appropriate for the severity of the offense and that will be constructive and rehabilitative. Jurors are randomly selected from the Teen Court volunteer pool. A jury may be comprised in part by previous offenders sanctioned to serve jury duty. Generally, cell phones are also prohibited in the Courthouse however Teen Court guests are permitted to carry one to coordinate transportation following the session. Cell phones must be turned off while inside the Courthouse. Cell phones are not permitted during normal Courthouse hours. Teen Court is a juvenile justice diversion program offering first-time offenders between the ages of 12 and 17 the opportunity to accept accountability for minor crimes without having to incur a permanent record. Juvenile respondents are judged by a jury of their peers as part of this voluntary program, which is designed to reduce the number of youth offenders and educate them in a realistic court environment. Since the program was established in March 2001, hundreds of teens have been given the opportunity to accept responsibility for their actions and change their behavior. The program also gives teens who are interested in the judicial system the opportunity to help their peers while gaining first-hand knowledge of the court system. Adult volunteers serve as judges. 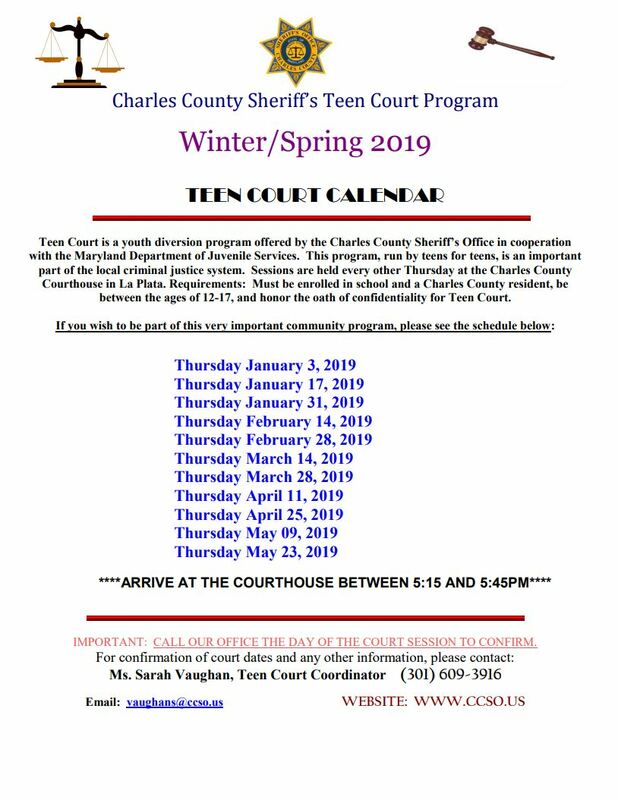 Teen Court is a program for youth between the ages of 12 and 17 who resident in Charles County, Maryland, and are currently enrolled in school. Those who are eligible may be referred to the program by a presiding judge for traffic violations or, in instances of misdemeanors, selected by the Teen Court coordinator or a Sheriff’s Office Juvenile Intervention Officer assigned to the child’s school. The child must enter a guilty plea to be accepted into the program and parental consent and participation is mandatory. There is no charge to participate in Teen Court. However, any applicable restitution must be resolved. The following dress code is enforced and applies to all respondents, jurors and volunteers. All attire must be neat and clean. Dress pants and a collard shirt or blouse are considered examples of appropriate attire. Girls may wear dresses or long skirts. Cell phones, smart phones, tablet computers, MP3 players, etc. Where are the Community Service work sites? What are the sanctions for a particular offense? Sanctions include a variety of consequences based upon the severity of an offense and can include: community service hours, Teen Court jury service, letters of apology, research papers, ambulance ride-alongs and other special projects. The Teen Court jury determines the appropriate sanctions based upon the evidence presented and the sanction guidelines provided by Teen Court. What happens if I am referred to Teen Court from the District Court Judge or by an Intervention Officer? Those referred to the program by a judge or officer will receive a form and should contact the Teen Court coordinator to schedule an appointment for their preliminary interview. During the interview, the respondents will receive their court date. What happens if I don't complete my sentence? Respondents who fail to complete the obligations required by their sanctions will be required to complete the judicial process through the District Court Judge or the Department of Juvenile Services and the offense will become part of the State’s official records. Yes, the cases and the consequences are real. The Teen Court judge has power to remove from the Courtroom and/or hold in contempt any disruptive or disrespectful Courtroom observers or participants. The Teen Court coordinator and/or the judge reserve the right to refuse to hear the case of any youth who fails to abide by the rules of the Court. First and foremost, Teen Court places the responsibility of the offense on the teen while avoiding the formal record established by the Department of Juvenile Services. Teen Court helps teens turn a mistake into a hands-on learning experience and reduces the chance of teens committing future criminal acts by increasing the teens’ awareness of the law. Teens acquire valuable work experience while contributing their service to the community. In traffic cases, the program saves teens and parents the expense of fines, points and other court costs. Teen Court is operated by the Charles County Sheriff’s Office and supported by additional grant funding from the State. Private sponsors make various other contributions to the program. Can I be a respondent and return as a volunteer? Do you have opportunities for teen and adult volunteers? Yes. Volunteering for Teen Court is an educational and rewarding opportunity for teens and adults alike. Will my service as a Teen Court volunteer count toward the Student Service Learning Project required for high school graduation? Yes. Volunteer jury members receive hour-for-hour credit toward their community service project hours. The project record sheet and guidelines are available from each teen’s respective school. If the school requires a letter from Teen Court, please contact the Teen Court office and allow 48 hours for the letter to be issued. Teen Court will not deliver the letter to the school. The student or a parent must make arrangements to pick up the letter from the Teen Court office. What happens if there is inclement weather on a Teen Court night? If schools are closed for the day and Teen Court is scheduled for that night, Teen Court will automatically be cancelled. If schools close early and Teen Court is scheduled for that night, Teen Court will automatically be cancelled. If schools open late and Teen Court is scheduled for that night, it will be the coordinator’s call if there will be Teen Court that evening. If schools are on a regular schedule and Teen Court is scheduled for that night, and inclement weather starts after school or is predicted for that evening, it will be the coordinator’s call if there will be Teen Court that evening. If the coordinator cancels Teen Court, a message will be placed on the Teen Court answering machine as well as an automatic response stating “Teen Court is cancelled” on e-mail as well. For more information or to provide comments about Teen Court, contact Teen Court Coordinator Sarah Vaughan. Call 301-609-3916 or e-mail vaughans@ccso.us.